Workers on strike at the Omron Automotive Electronics Co. Ltd. plant in Guangzhou, China. GUANGZHOU, China (Reuters) -- Workers at Japanese electronics maker Omron's southern China factory have gone on strike, the latest disruption in the manufacturing hub over demands for better wages and working conditions. The burst of disputes that started in May has since affected more than a dozen mostly foreign-owned factories, raising questions about the region's future as a low-cost manufacturing base. The Omron strikers, who walked off the job on Wednesday morning, are demanding a pay raise of at least 40 percent from their current salary of 1,270 yuan, with some workers saying they want an increase of 500 yuan ($74) per month and another saying the demand is for 800 yuan more. One of the strikers, who declined to give their names because of concerns about retribution, said the factory makes mainly switches and ignition keys for Honda Motor Co., Ford Motor Co., BMW AG and other carmakers. A spokesman from Omron said 200 to 300 of its 800 workers had gone on strike at its Guangzhou plant, while workers said the number of strikers was more like 400 to 500. Beijing, which normally stamps out any kind of grassroots movement fearing a threat to stability and Communist Party rule, appears to be willing to tolerate the strikes, in part because they dovetail with many wider political goals. Higher wages help boost potential for domestic consumption, could rein in anger over a growing rich/poor gap, and help the country move up the value chain away from cheap manufacturing. Southern Guangdong province, the country's export hub, is even drafting a new law that the official Xinhua agency said would be the first in the country to set rules for wage negotiations and labour disputes. All was quiet at the factory in the city of Guangzhou, capital of Guangdong province, on a rainy Wednesday as a tropical storm approached. Some 10 people were gathered on a balcony at the plant, including one holding a sign with a mobile phone number to call. Others remained in the building, peering out of windows. "The cost of living in Guangzhou is rising but our wages from the factory aren't increasing at the same pace," said one woman who has been working at Omron for two years. "That's why we're asking for an increase." "Management hasn't threatened to fire us. But neither side wants to back down," said another worker. "If we don't hear anything back we will go back on strike tomorrow." 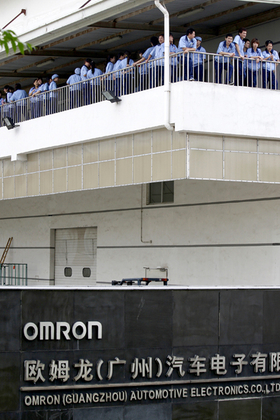 Omron shares extended losses on news of the strike to end down 3 percent at 1,982 yen in Wednesday trading in Tokyo. Japanese firms, the targets of many strikes, may be particularly vulnerable as many rely on single suppliers from affiliated companies, making it difficult to find alternatives if production is disrupted, said Koji Endo, an analyst at Advanced Research Japan. "Workers know that well. That is why they think partsmakers would have to agree on a pay raise if there is a strike," he said. "For Western companies, they can just shun the partsmaker if there is a strike and move on to another one." More strikes are likely in the coming months, particularly as the summer heat makes it uncomfortable to work on southern China's production lines. "You have to consider that it is now summer," said Geoffrey Crothall of the China Labor Bulletin. "In a lot of the strikes, one of the demands has been for better working conditions, and in summer it often becomes unbearable because management (at Chinese plants) is too cheap to have proper air-conditioning and ventilation in the factories." Most of the recent strikes have been resolved, but the one at the Omron factory comes as stoppages resume after a brief period of relative calm in early July. A week-old strike at a plant supplying gear sticks to Honda appeared to be moving toward resolution, as management agreed to a 500 yuan per month raise that workers had been demanding, a worker told Reuters on Wednesday. That strike, at a factory owned by Atsumitec Co. in the city of Foshan, began last week and has resulted in an extended stand-off between management and the factory's 200 workers.